“What you are hearing will never be heard again, can never be repeated. 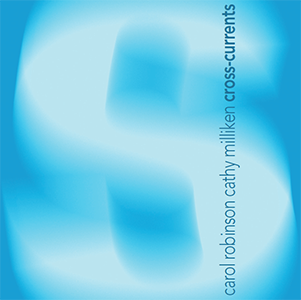 What you are hearing exists due to chance operations, an entire composition of multiple interlocking pieces in ever-changing orders, a piece without beginning or end, an evolving music always ready to be heard.” So writes clarinettist Carol Robinson of her work with oboist Cathy Milliken, which, when extracted from the DVD-ROM and loaded into your computer, will only stop – or rather fade out – when you choose to stop it. The idea of an open work that “gains aesthetic validity when it can be contemplated and understood from multiple perspectives” (Umberto Eco) has preoccupied artists and writers for well over a century now, from Mallarmé via Joyce and Duchamp to the mobiles of Calder and their subsequent influence on Earle Brown and John Cage. Mallarmé’s notion of a book whose volumes, pages and even individual lines could be read in any order and any direction was an inspiration to Pierre Boulez in the 1950s, and so it’s fitting that Cross-Currents should have been realised with technical assistance from IRCAM, the research institute Boulez founded in 1974. Robinson recommends listening through headphones, but you probably won’t want to stay parked in front of your laptop for hours on end, even if the minimal onscreen visualisations are pretty to look at. Playing the work through speakers at decent volume to appreciate IRCAM’s transaural surround sound is just as enjoyable. The temptation to leave it on in the background as a permanent installation is strong, but Cross-Currents is neither a turn-on-tune-in-drop-out Dream House environment nor an exercise in Satiesque musique d’ameublement: the 35 constituent musical elements, though carefully conceived to work together, are often individually striking in profile, and make as much use of silence as they do of the extended techniques of the seven different reed instruments Robinson and Milliken play. Their harmonic combinations are often startlingly acidic, with a Stravinsky-like angularity that firmly if gently subverts any notion of Ambient chillout. Even so, the knowledge that you’ll never again be able to experience what you’ve just heard is frustrating. It’s like driving through a beautiful landscape without being able to leave the motorway or pull over to admire the view.